Mike Jenkins won a national championship playing football at James Madison. Now he pursues a world championship on the strongman stage. Follow his strongman workout. 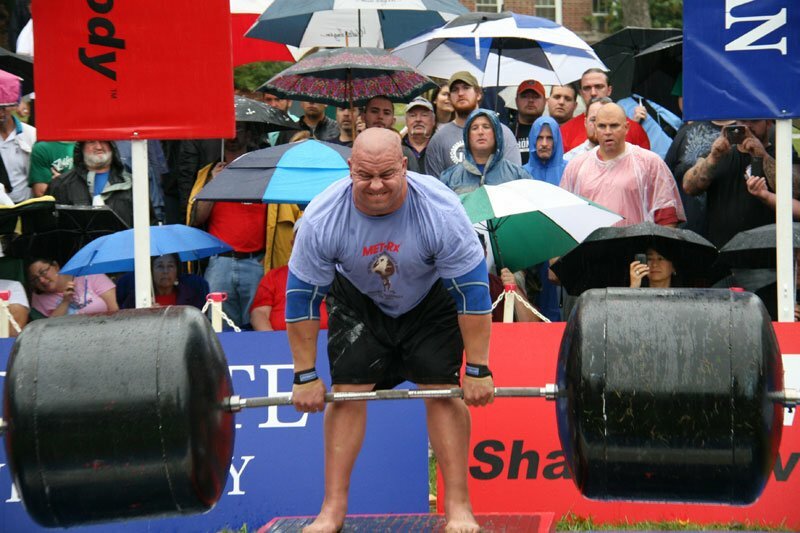 I never thought I would one day compete against the best in the world and hold my own at World's Strongest Man, The Arnold, and other contests. I never thought it, but I definitely dreamed it. I grew up in Westminster, Maryland playing football, basketball and lacrosse. I was always the biggest kid, so I had to play with the older kids—who were still usually smaller than me. I graduated high school and earned a scholarship to play college football. I started my collegiate career at Kent State University. Then I transferred to James Madison University, where I earned a Master's Degree in Athletic Administration and played football for four years, winning the I-AA [FCS] National Championship my fifth year (2004). I was always interested in being big, strong and fast, but only to make me better on the field and court. I never considered shooting for the World's Strongest Man on ESPN. That is, until I got hooked while I was at JMU. I started to understand how the body worked and how to get REALLY strong with Jim Durning, my strength coach for all four years. When I was done playing football, I knew I was not done competing. I just had to figure out what to do. This bar tab is measured in pounds - many hundreds of them. I found strongman in the summer of 2007. 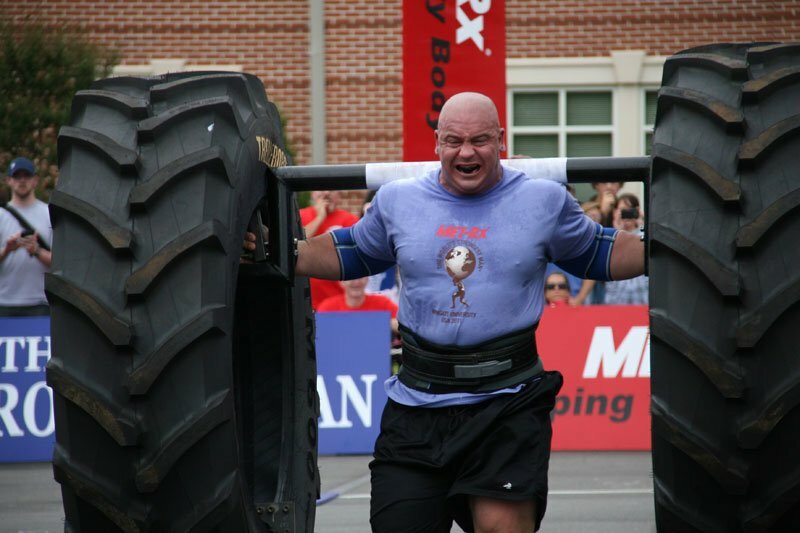 I entered Maryland's Strongest Man that August with about a month of training on two of the five events. I won the entire show. Only 3 months later, I tried my hand at a national level NAS (North American Strongman) contest. I did OK: 6th place out of close to 100 guys, with only a few months of training under my belt. I found my calling, but I still had a lot to learn. I was so close to turning pro over the next two years. Looking back, I am so happy I took my lumps and didn't! Being so close, so many times, actually put me in the right place at the right time. 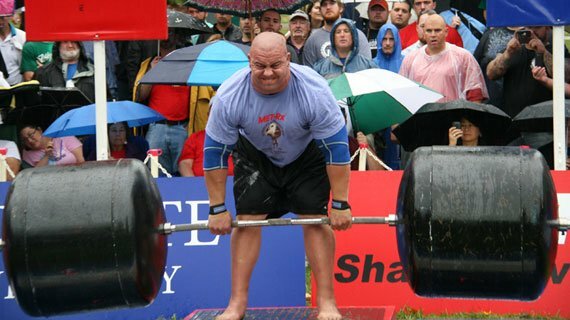 I won the Arnold Amateur World Championship in 2010 to earn my pro status and a coveted spot at the Arnold Strongman Classic the following year. I shocked both myself and the world, finishing 2nd to Brian Shaw. 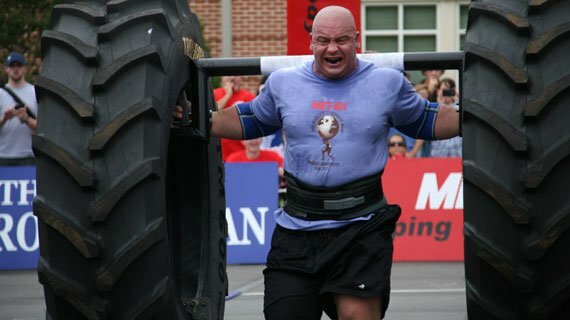 I did a Giants Live, WSM (World's Strongest Man) qualifying tour in Poland in August of 2011. I finished 2nd, which qualified me for World's. I realized a dream I'd had since the day I lifted my first log! When the tire's taller than you are, tread carefully. To go to World's, I had to do more than pack a bag and roll. I was forced out of my job as a health and physical education teacher in Harrisburg - I didn't have any more paid time off from prior contests and events. It was an easy decision for me. I have been criticized by some, but it was the opportunity of a lifetime. Most of those people will never have to choose between the pinnacle of their sport or a job where they're not appreciated for the difference they make in the lives of less-fortunate youth! I also was able to live out another dream: owning my own business. I started Catalyst Athletics in Harrisburg, Penn. I specialize in unique Strong-Fit Boot Camps, Sports Performance and Strongman Clinics, which I have done at a number of Crossfit gyms throughout the Northeast. Where else can you learn from one of the strongest men in the world? I eat as clean as possible. Having a fiancée who competes in NPC Bikini shows makes it easy to keep the bad stuff out of the house. I try to eat for what I am going to do, not what I did. I follow a modified Paleo diet. It's very low carb for someone who weighs almost 400 pounds and is very active, but it works for me. I try not to give out too much advice on diet, because everyone's body is so different. What works for me probably will not work for someone else, even if we have similar body types and lifestyles. I try to keep it simple and train by the motto: "If it's not broken, don't fix it!" At World's Strongest Man, there are probably 30 different training methods between the 30 guys there. All the methods obviously work if what each guy does has earned him that spot. If I find something that works, I stick with it until I hit a flat spot. I occasionally try things I hear from other competitors to see if they work for me, but if something doesn't feel right, I won't push the issue. My training varies year round. In strongman, you have to possess endurance, static one-rep strength and speed. This routine outlines my Arnold preparation. Clean and Press: I will use my Apollo's Axle or Circus Dumbbell, then hit some push-presses from the rack. On these days, I will work up to a 3-rep max with the axle and an all-out, max-reps set on the dumbbell. Since the Arnold is a one-rep max on the Hummer tires, I will do a lot of pulls off blocks and occasionally pull from the floor. I progress from sets of 5 down to sets of 3. Then, as the show gets closer, I try more for one-rep maxes. I do assistance work after my main lift, either good-mornings, stiff-legged deadlifts or sumo straight legs. I never go too heavy, stay around 60-70% of my max and try for 12-plus reps for 3-5 sets. I always finish with some pull-ups, usually 2 sets with 2 different grips. Pull-ups at 375 pounds make a mean workout! Barbell Squat: Since I don't have to squat at the Arnold, I just try to go up a little each week and stay in the 5-8 rep range. No need to go for a pointless max. I start with a variation of overhead strict press. Like my clean and press, I work up to a 3-5 rep max and go no higher than 3 reps as the Arnold gets closer. I do some pressing assistance, usually floor press or incline. On these lifts I shoot for a 5-8 rep max, going for shoulder strength or triceps work. I always finish with at least one direct triceps movement, usually a dumbbell or barbell skull-crusher for 4 sets of 8-12. Occasionally I mess around and hit 405 for reps on the bench to get a good burn. Sled Drag - Harness: I do whatever lifts I have in an upcoming show that I cannot do in the gym. For the Arnold, this is frame carry and atlas stones. If it's another contest, I will usually do 2-3 events on this day with some prowler work and sled pulling at the end for cardio. I try to get as many nutrients as I can from whole foods, so my supplements are pretty simple. All of them work for me, however, and have a purpose in my training. I use the Ultramyosyn wherever you see shakes in my diet plan. Shakes help me get a meal when I'm tired of eating solids or a "quickie" meal in the middle of the night. I used Amped before my workouts if I need a little boost. I will put Creatine in my post-workout shake and before my bedtime snack. The BIG 100 bars are great for extra calories when training gets heavy and I need that extra lift from my diet. I usually eat one in with my mid-night quickie.